This is a beautiful book. I don't just mean beautiful as in the content, though that's lovely too. I mean the production quality on the actual item is beautiful: the paper is thick and smooth, the colouring of the illustrations is gorgeous (the illustrations themselves are perfect) and the typesetting is lovely, even if some of the font changes between main body and folktales and handwritten letters felt just the tiniest bit excessive. It weighs nicely in the hand. In short, this is an extremely attractive book. I do so like it when a publisher takes that kind of time and makes that kind of effort. It feels like they were considering the entire experience they want the reader to have. 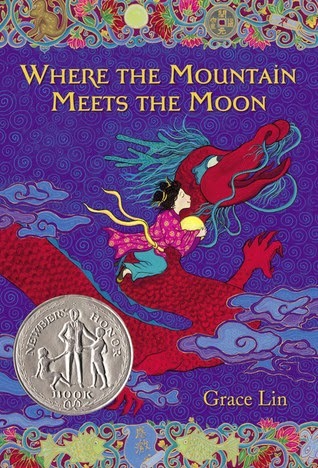 It matches the story inside, in this case: Where the Mountain Meets the Moon is careful, lovely, and colourful. Minli is the daughter of very poor farmers, who scrape a bare subsistence living from the ground near the muddy, turbulent Jade River and the aptly named Fruitless Mountain. The bright spot of her days are the stories her father tells Minli and her mother at night after dinner. Her favourites include the story of why nothing does grow on Fruitless Mountain, and a story of the Old Man of the Moon, the Immortal who knows everyone's fate, and controls their destined meetings. One day, after purchasing a goldfish on a whim, hoping to change her family's fortune, Minli decides that she must search out the Old Man of the Moon herself. Thus begins a long, sometimes strange, sometimes frightening, sometimes funny, and always interesting journey. It is a simple story, told in very simple language, and things are relatively straightforward. The enjoyment is in the creativity of the plot itself, and the way the story is told. The characters are spare, but somehow still engaging; I am not sure exactly how Lin managed that without making them cardboard cutouts (aside from the villain, who was pretty two-dimensional.) It's also deceptively busy. It's a story in which an awful lot happens, but the pacing is incredibly well done. One never feels rushed, and even the ending, which could have felt like it happened too quickly, didn't. It felt just right. Throughout the body of the story, which is split between spending most of our time with Minli and Dragon, and a bit of our time with Minli's parents, are sprinkled little folktales. They take their inspiration from Chinese folklore, but my understanding is that these tales are mostly Grace Lin originals, heavily influenced by traditional stories. These short little gems, told formally and separated from the main story by narrative style and differences in font, each have something to say to the main storyline as well. Minli loves stories. Ba tells them to her every night, and it is from these stories that she gets the original idea to go find the Old Man of the Moon. Minli's Ma, however, is a tired, embittered woman, who cannot understand why the other two bother with tales when nothing of material good comes out of it. The contrast and struggle, and the love, between Ma and Ba was one of the highlights of the novel for me. Weight and consideration is given, without being heavy-handed, to the power of stories and the need for them; Lin also weaves in the importance of certain virtues, again without being too heavy-handed (mostly): gratitude, generosity, loyalty, initiative, patience, cleverness, kindness. Minli gets where she needs to because she has each of these characteristics in spades, except maybe patience. Even then, she can be patient when she needs to be, and Ma and Ba's tale is all about patience and loyalty. I am absolutely looking forward to reading this with my parent-child book clubs at some point. I will, unfortunately, have to wait until next year, as this year's choices are already made. But it's a book that will read aloud wonderfully, and I think equally enjoyed by adults and children. Recommended for those looking for a gentle adventure. Also, the fact that this takes its inspiration from a culture very different from many Western books written in English doesn't hurt; I'm always on the lookout for middle-grade books that can expand kids' horizons. I really liked this book, too. I did it via audiobook, so didn't realize until much later that it was an illustrated story. I want to see it in person! There is a sequel, too! I know! I am pretty much going to try to read everything Lin has done at this point, I was so impressed. Really, the physical book is so worth seeing. Just lovely. But I think it must read aloud really well, so it would be a good choice for an audiobook. I could actually barely keep myself from reading it out loud to myself!